Your car stereo system is one of the most important accessories and it demands for constant power surge and this is where a car audio battery comes in handy. A good car audio battery should be in line with the modern technology and it should be backed with essential features. This will ensure that your car sound system is on point to hit those numbers regardless of whether it is a short or long car adventure. Car audio batteries just like other batteries come in different types and what works in one car audio system may not work in another. This is why it is important for us to highlight the various types to help you determine the right kind for your car audio. Calcium-Calcium: This battery is made up of calcium plates which are charged separately. The key element in this battery is the use of calcium which helps to reduce the rate of discharging by reducing the amount of fluid that is lost. Deep Cycle: The deep cycle battery is highly durable and comes with thick plates which help increase its capacity charge. It, however, has a high discharging rate. Wet Cell: This battery is spill-proof and the fluid doesn’t need to be topped up. Its plates are suspended in the fluid but they are well insulated. It is mainly regarded as maintenance- free battery. VRLA (Valve-Regulated Lead-Acid): This battery comes with safety valves and lead acid. It is also sealed completely meaning it can only be replaced in case of any malfunction. This mats that helps to reduce internal resistance. Lithium-Ion (Most expensive): This battery stores a lot of energy but it’s a bit higher on the price spectrum. It, therefore, has a limited use mostly in electric automobile although today a good number of vehicles use this battery. Finding the best car audio battery is not an easy task. It can be especially frustrating to deal with a dead battery and that’s why we are here help you chose the best battery and avoid the frustration. During our survey, we made it a priority to capture the key features of each battery as well the quality and performance. The number of cold cranking amps (CCA) was tested against the amount of watts produced to establish if the two were well synchronized which is essential for a battery to perform well. We ended up with a list of 10 top rated car audio batteries. 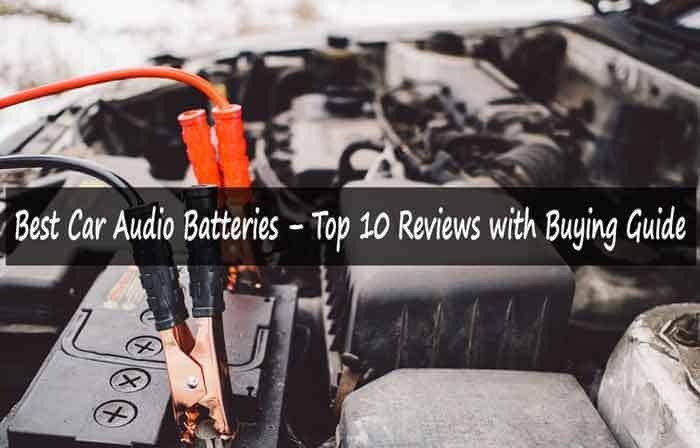 That’s said; let’s have a look at what these batteries have to offer and don’t forget to go through our buying guide thereafter to guide you in picking the best power source for your car audio. From the house of LifePo4, we present to you this 100 Ah LifePo4 car audio battery which is one of the most versatile and reliable battery available in the market today. It is packed with extraordinary features and it is maintenance free making it a must-have battery for your car audio and you will translate many years of service. Cutting Edge Specs: Weighing just 20 pounds, this 12 volt and 100 amp hour battery doesn’t require any hardware for it to run your sound system. All you need to do is just fit it in the battery tray and just like that, you are ready to hit the road. The fully featured Battery Management System (BMS): This system is provided by the Power Control Board (PCB) and it is the heart of this battery. This system offers protection against short-circuit, reverse polarity, low and over-voltage, as well as balancing the charge and voltage of individual cells. The BMS also allows you to connect several 100 Ah LifePO4 batteries parallel to each other without the need for any external protection. Circuit Boards: These circuit boards that are aligned throughout the length of the cells help to control the pressure, current,and temperature. If for example, there is a case of high internal pressure, the boards will respond by an automatic voltage cutoff which is going to cutoff the positive and negative current. These circuits’ boards also help to prevent any damage to the battery by any short-circuited cell. Solid Construction: The 100Ah comes with an ABS casing with each cell terminals welded to a plate to help provide a solid ground for both electrical and physical connection. In addition to this, each cell has 3 layers for safety protection pushing the durability of this battery way above any other. This battery does not freeze even in extreme temperatures. It is lightweight and its weight is almost half of its lead-acid counterparts. It uses just a protection circuit instead of Battery Management System (BMS) for power control. Not suitable to be used as a cranking battery. Our Verdict: With the impeccable features and specs, 100 Ah LiFePO4 has earned this position rightfully and we believe that this is the battery that you need to upgrade your sound system power needs and you will be assured of uninterrupted performance. This battery is a definite pick if you are serious about a complete overhaul of your car audio charge system. Odyssey PC680 is specially built in rugged construction to help it withstand the forces of the nature that it may encounter while on the road. It offers fantastic features and it is also one of the most affordable batteries in the market today making it a perfect choice in cases where your battery dies without a warning. Longer Cycle Life: Odyssey PC680 boasts itself for having about 70% longer cycle life when compared with traditional units. This is in addition to its 400 cycles at 80% level of battery discharge and also high and stable voltage for an extended period of time. Faster Recharge and Remarkable Mounting Flexibility: Recording one of the best recharge efficiency on the market, Odyssey PC680 is capable of hitting the 100% charge mark in just 4 to 6 hours. It also comes in a non-spill design which makes it easy to mount it in any position without worrying about spills. Vibration and Temperature Resistance: Odyssey PC680 comes in a designs that is tolerant to vibrations and high impact shock that the car may be subjected to while on the road. This car audio battery is also best known for its high tolerance to extreme temperatures. Variations in temperatures have no or very little effects if any. A Combination of Absorbed Glass Mat (AGM) and Valve Regulated Lead Acid (VRLA) Technologies: A combination of these two technologies makes PC680 to function as two batteries in one; one with tremendous cranking power and also deep-cycle reserve power. This battery can support both applications as opposed to traditional units which can accommodate only one of the applications. The additional thin and densely packed plates make this battery provide twice as much power of common batteries. Odyssey PC680 is resistant to mechanical vibrations and is not affected by extreme temperatures. It has a longer cycle life as compared with other deep cycle batteries; usually 70% more. Fast and quick recharge as it takes about four to six for it to be fully charged. It is completely sealed meaning no spillage which allows for flexibility during mounting. It has an average of 400 cycles at 80% depth discharge which leads to high voltage for extended period of time. With only 170 cold cranking amps, it is not appropriate in extremely cold temperatures. PC680 does not come with terminals. Our Verdict: PC680 is well designed to take care of all your power needs in its long lasting design, cutting-edge features and comes at an amazing price. Order Odyssey PC680 today on Amazon and brace yourself for constantand long-term power supply. This maintenance free car audio battery from ACDelco comes with the AGM technology and also spillproof technology which means you don’t have to worry about common battery problem of acid leaks. The featured valve regulated technology makes sure that this battery will give you three times life cycle as compared with ordinary batteries. Absorbed Glass Mat (AGM) Technology: In addition to boosting the amount of power that this battery produce, the AGM technology makes sure that there will be no spills or leakages and also it does not leave room for any maintenance as it seals the battery completely. Valve Regulated-Gas Recombinant Technology: ACDelco ACDB24R makes use or his technology which helps prevent gas leakages for safety purposes and prolonged lifespan making it last 3 times more than traditional units. Calcium (Positive and Negative) Plates: This battery comes with calcium plates both positive and negative and power grids which helps to reduce the discharging rate when the battery is not in use and also to increase the cranking power amps during the same period. Silver Calcium Alloy: The additional alloy of calcium and silver acts as the cathode for optimizing conductivity and performance. In addition, the alloy of these two metals helps to strengthen the battery with internal low- resistance. This, in turn, strengthens the audio power back up. ACDelco ACDB24R is resistant to leaks and spills. It is maintenance free due to its sealed nature. It has up to 3 times the cycle life of many traditional units. The battery can be stored off season thanks to its frame grids and calcium plates. Its high-density oxide plate provides outstanding levels of power. The battery is prone to mechanical vibrations. It has very small and non-standard terminals. Our Verdict: ACDB24R from ACDelco is an efficient battery that will perfectly provide you with that powerful ignition that you have always wanted free from any hitches. Don’t be afraid to grab this all-inclusive battery while it lasts. The reliable 8025-160 from Optima is designed to deliver robust power to your car audio each and every time your sound system is in operation. It is also designed to cope with extreme launches and extreme weather conditions making it outperform traditional batteries. Its resistance to common causes of battery failures makes this brand reputation remain uncontested. Spiral-Cell Technology: This battery adopts the spiral cell technology as opposed to AGM technology which is composed of 99.99% pure lead plates coated in lead oxide. This design makes 8025-160 more tolerant to temperatures and automated processes in an attempt to keep up with the required performance and quality. Works Well in Extreme Conditions: The 8025-160 is known to work efficiently even in extreme conditions where it delivers sufficient starting currents. This battery is not damaged even in situations where the charge drops deep or when it is stored for long periods. It is also not affected by occasional mechanical vibrations. High CCA: With as high as 720 Cold Cranking Amps, 8025-160 is one of the strongest car audio battery delivering fast ignition in just seconds. It is also very consistent in each startup outperforming close competitors in their own game. Faster Recharging: Just like other optima batteries, 8025-160 has a very fast recharging rate making it convenient for most car audio systems. It is also has a slow discharging rate and it is not damaged when the charge gets low. Just as the title itself, the battery has optimal starting power irrespective of temperatures. It can be mounted in multiple positions as it is spillproof. Improved resistance to vibrations; about 15 times that of traditional units. In some cases, it may have a reduced lifespan. It is slightly specialized and may not be compatible with some audio systems. Our Verdict: Optima Batteries 8025-160 is all about been optimal; Optimal power, optimal resistance,and overall optimal performance. Check this powerful equipment on Amazon and see its astonishing ratings. This rechargeable EXP1290-2 from Expert Power has made a name for itself in the lead acids batteries market as one of the most preferred car audio battery. Packed with user-friendly features to give you peace of mind and its high durability make it stand out amongst its close competitors as one of the most powerful car audio battery. Compatibility: ExpertPower EXP1290-2 is fully compatible with most APC backups giving you ease of mind especially when you are required to connect your battery to such applications. Uses the AGM Technology: This technology ensures maximum absorption of the acid by the plates alongside preventing any spills and allowing it to operate over a wide range of temperatures. This helps to prolong its life cycle. In addition to this, it is valve regulated meaning it requires close to nil maintenance as you don’t have to check for distilled water level. Rugged Design for Durability: The rugged design makes it perfect for rough situations which ensure durability. The battery is also relatively light which provides for ease of installation which is further simplified by its user-friendly nature meaning it only takes few minutes to get your system up and running. It has incorporated a technology that allows for very slow self-discharging. It uses the AGT to operate over a wide range of temperatures. ExpertPower EXP1290-2 is maintenance free as it is valve regulated. The battery is durable and its design allows easy setup. It is highly resistant to heat as it is enclosed in a non-conducive ABS plastic. It needs to be checked regularly for distilled water refills. The battery needs time more to be fully charged as compared with other batteries in our list. Our Verdict: ExpertPower EXP1290-2 comes in an easy setup and safe operation saving on time and it is also quite affordable. This battery is more than affordable which is why you should not miss this rare chance to improve your car audio power system. HC600 BLU Series from Kinetik is designed to provide your car audio with optimal power without overworking your battery. It is powerful enough to run audio systems that produce about 600 Watts and anything more than that may require you to get an alternative battery. However, it has all it takes to get your sound system running. Top Notch Specs: This 12Volts battery delivers more than expected power meaning it can be used to power your sound system alongside the car engine. It is lightweight and delivers high amps and its AGM presentation provides an elongated battery life and increased performance. Perfect Replacement for your Car Standard Battery: The Kinetik HC60-BLU can be used as an alternative battery to your ordinary car battery on top of upgrading your sound system power. Its lacks of external opening and it been leak proof makes it perfect to be used in many places without dangerous leaks. Resistance of Extreme Conditions: With 600 Cranking Amps with a 18 amp hour rating the HC600-BLU is designed to resist vibrations and extreme temperatures. This means that this battery is ready to get powered up and ready to go anywhere, anytime and under all circumstances. Sealed in ABS Plastic Case: The HC60 BLU delivers a high load of voltage packed in the extra plates resulting into low ESR which translates into extra amount of power. This is reinforced by the ABS plastic casing which seals the battery completely and makes it resistant to excess heat. It comes with absorbed glass mat which improves its durability, offer good resistance to mechanical vibrations and ensures minimal maintenance. It can accommodate a car audio system with 600 watts or even more. The included extra plates make it have low ESR which leads to strong density. It has been reinforced with 800 amps of power which means improved performance. Comes in a non-leak design. It requires an AGM battery charger for it to be properly charged. The battery may experience dimmed lights at 700 watts if it is not well maintained. Our Verdict: Kinetik delivers high quality and high-performing products which is why HC600 BLU Series features in our list and we confidently recommend it. Check HC600 BLU Series on Amazon for the latest prices. Diehard is known to produce highly durable and powerful batteries and this 02838228 car audio battery is no exemption. Its cutting-edge features which include the ability to recharge quickly and produce extra power as well as retaining more electrolytes makes it stand out among its competitors. It is Well Protected Inside, Out: Coming in a heat resistant and tamper-free design, the 02838228 from DieHard present you a battery that is protected inside out which is an assurance that all the internal components are safeguarded as well as presenting an image of sophisticated equipment. More Durability, More Protection: It is estimated that this battery has 20 times or more vibration resistance which in the long run means a longer life. Its life cycle is twice that of ordinary batteries, recharges twice as faster and is slow to discharge. It Features AGM Technology: The AGM technology has a number of applications as we have seen with most of the batteries that we have reviewed in our list. In this particular case, it helps to minimize the amount of electrolytes consumed by the battery by holding on to many as possible. This, in turn, delivers as much as possible power to your audio system beating the rest big time. Cutting Edge Technologies: The DieHard 02838228 is truly the house of technologies and unbeaten applications from the AGM technology, spillproof design, quick recharge, to its ability to work under undesirable conditions and retaining a good number of electrolytes. This is what makes it a good choice for your car audio any time. This is a heavy-duty battery and it offers 20 times vibration resistance. Improved power time with a minimum of two hours power time. Its Spillproof design helps to prevent any acid leaks. The fully optimized negative and positive plates help to prevent electric shorts. It encompasses a superior AGM design to enable it work under elevated temperatures. Maybe heavy and bulky as compared with similar models. Our Verdict: The DieHard 02838228 is the best car audio battery especially if you are on a budget but we assure you it’s nothing short of quality performance. Fit this battery in your car today and you will be amazed how perfect it is. This Shorai battery is special in our list.it is the only battery that is nature conscious as it requires that you just discharge it and dispose it where it will decompose naturally. This is of course after providing you with many years of over the bar and constant power to your audio system. Considerably Lightweight: Shorai LFX36L3-BS12 is considered as one of the lightest car audio battery weighing just a fifth of average Lead-acid batteries. This makes it’s a perfect choice for your upgrade with this added advantage adding to your convenience not forgetting the massive power capacity. No Gas Explosives: Shorai has designed this battery with your safety in mind. The LFX36L3-BS12 is completely sealed such that no gas explosives can occur during charging which can be a big safety hazard to both humans and the environment. Eco-Friendly: This battery is friendly to the environment both during use and after use. As stated earlier, it does not emit gas sparks during charging making it safe for use. The battery also requires that you just discharge and dispose it when it is no longer in use where it decomposes. Lightening Recharging: Shorai LFX36L3-BS12 has a superfast charging rate which is done twice every 12 months depending on use and as well as storage temperatures. This battery is a deep cycle battery meaning that it easy not easily damaged even when the charge capacity drops meaning it can still fire your system even when the charge is low. It also has a slow discharging rate. The battery casing is heat and vibrations resistant. It is quite light in fact it's 1/5 that of other lead-acid batteries. It quickly recharges and the charge can last all year long. Its design does allow for any gas leakage during charging. The batter is special of a kind as it eco-friendly as it can be disposed immediately after discharging. Continuous charging could affect the efficiency of the battery over time as it could heat up uncontrollably. Our Verdict: This may be the only chance you have to save the Mother Nature by getting Shorai LFX36L3-BS12 which guarantees you of safe disposal after use. Consider Shorai LFX36L3-BS12 for a whole different experience. If you are planning to go big on your car sound system then XS Power D3400 is the way to go. With amperage of 3300, it can work well with systems that produce up to 3500 Watts which is why we recommend it for major upgrades considering the fact that it is also a bit high on the price spectrum. AGM technology: XS Power D3400 is a deep cycle battery and it features the popular AGM technology which holds the electrolytes between the plates in its non-leak and non- hazardous design delivering a longer life cycle when well charged. No corrosion, Do Damage: The absence of external vents means that the battery can be installed anywhere in the car with no fear of leaks which means that they will be no corrosion or damage to its surroundings irrespective of the mounting positions and various forms of shock. Extra Source of Power: This 12 Volts deep cycle battery is powerful enough to upgrade or replace your car audio power source and fire it up in a splint of a second whether you are driving or just parked. Mounting Flexibility: This battery offers generous mounting positions thanks to its leak free design. D3400 is fully sealed from any spills giving you a hassle-free installation process. Highly versatile and it is easy to install in multiple positions. He valve regulation coupled with spill protection makes it tough and highly durable. It can takes very high power promptly. It can work in extreme weather and other situations as it is resistant to shock. It has a very low internal resistance. It is a bit expensive when compared with other batteries. It feels and appears to be heavier than other models. Our Verdict: Expected to dig deeper into your pockets, expect nothing less than enhanced performance and a prolonged life cycle making sure that each dollar count. Try XS Power D3400 and you will surely get value for your money. This deep cycle battery from Mighty Max brings you the much-sought performance at a very affordable price. This heavy-duty battery guarantees you great performance while outperforming close brands in its ability to handle more intensive task as well as lasting much more than expected. All this is brought to you for just a fraction of your budget. Corrosion-Free: Featuring a calcium alloy and the famous AGM technology, corrosion is unheard of meaning that you can concentrate on other thing without thinking about the mess and maintenance. Valve-Regulated: On top of being a completely sealed lead acid battery, the Mighty Max is also valve regulated which means that it has a valve which prevent overheating during charging by releasing extra gas thus preventing potential damage to the battery as well as providing the much-needed ventilation. Insensitive to Positions: You can place the Mighty Max in any position as it is not sensitive to any position making it one of the most flexible battery in the market. Sturdy Design: Mighty Max is designed to be strong and sturdy enough to cope with vibration and shock while in use. It will also be subjected to a wide range of temperatures which is why this design is built to cope with the extreme temperatures (very high or very low). This rechargeable lead-acid is complexly sealed making free from any maintenance. It is compact and small in size making it installation much easier. It can operate in wide range of temperatures and has a long lifespan. It is resistant to vibrations and shock and can be mounted in any position. It is spillproof so you do not have to worry about the corrosive lead acid. The battery does not come with any accessory so you have to acquire them. It takes longer to recharge. It has a high discharge rate. Our Verdict: This battery is packed with a number of technologies and application that will have your audio system up and going. Why not try it today? Check out our ML35-12 on Amazon and it is worth every hassle. Having gone through our extensive review, these factors that we have highlighted below will help make an informed decision even as look at different variations offered by manufacturers. This is the ability of the battery to power the audio system in cold temperatures. A battery’s CCA should match the amount of watts produced and the higher the number of CCA the higher the amount of power produced. As such you should always look out for these two elements. The size should fit properly in the battery tray provided. You should check the dimensions provided in the user manual to see if it will fit. The positioning of the terminals should also be correct. This is important because just as with your primary car battery, loose audio battery will results into vibrations which will eventually damage the battery itself and consequently the audio system. Ideally, your battery will either require some little maintenance or no maintenance at all. Those that require little maintenance comes in unsealed design where you can add water occasionally before you can eventually replace them. Those that don’t require maintenance, on the other hand, are completely sealed allowing for only replacements in case of any damage. Just like other batteries, car audio batteries power units can get damaged if they are not charged for some time. Any battery that has exceeded six months since it was manufactured should be avoided as it is likely that it has lost some power. They are two major divisions of batteries that determine the price tag; wet- cells and dry-cell units. The dry-cell units are more expensive than the wet cell and they serves longer. Wet-cell, on the other hand, are inferior to the dry cell only that they power the stereo system a bit faster when compared to the dry cell. Before you settle on any battery for your car audio, you need to look out for the one that will give you optimal performance. A car audio battery is a crucial accessory as it relieves the main car battery of the burden of powering your sound system. Picking a durable and high performing one will assure you of many years of short and long trips with the desired level of entertainment. The car audio being an important accessory of the car, having a reliable source of power will come in handy for a more enjoyable road trip. We hope this guide has helped you avoid the pitfalls on your search for the best battery for your car audio.